Experts say the American agency that works to advance democracy worldwide is winding down its operations because of down funding and “waning interest” in Russia. 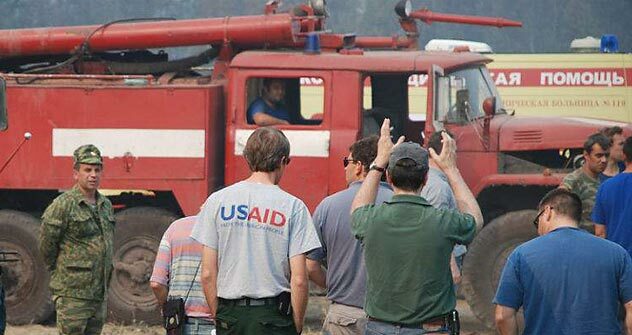 The United States Agency for International Development (USAID) has decided to wind down its operations in Russia, according to Iosif Diskin, the member of Russia’s Public Chamber responsible for liaising with the agency. Diskin said that USAID administration officials made the announcement during a recent visit to Russia. USAID is a U.S. government agency responsible for non-military foreign assistance. The agency’s administration is appointed by the president of the United States with Senate approval and operates in coordination with the U.S. Secretary of State. The officially stated goals of the agency include the advancement of trade, agriculture, economic growth and healthcare, as well as emergency humanitarian aid. USAID also works in over 100 countries to “help prevent conflicts and strengthen democracy,” according to agency material. A source at the U.S. Embassy declined to confirm or deny Diskin’s statement. “We are neither denying nor confirming this fact. You can easily have a look at publicly available data — our budget numbers are posted at the foreign.assistance.gov.com website. You will see that indeed, the level of funding for programs in Russia has been gradually decreasing. Naturally, this demonstrates a shift in priorities. It’s the U.S. Congress that sets USAID’s budget,” said the source. Sergei Markov, deputy rector of the Plekhanov Russian Economic University and a member of the Public Chamber, is confident that USAID’s Russia office didn’t make this decision recently – or on its own. Experts are divided over the reasons for this development, but they all agree that it has nothing to do with Russia’s passage of controversial legislation regulating NGOs. “The NGO law isn’t a problem for them at all. They will be able to channel money to different organizations and report programs as financed by USAID. They don’t train spies, and direct financing is not in their jurisdiction. What they decide is how to finance. If they don’t want to mention their name, they have an option of transferring cash to a Russian fund, or, to put it bluntly, to engage in money laundering. And then the Russian fund can pass the money on to Russian NGOs,” said Markov. According to him, the new NGO law doesn’t interfere with this set-up in any way. Political scientist Andrei Piontkovsky agrees that the decision was not related to the NGO law, only if for the reason that agencies of this sort can’t react very quickly. Piontkovsky said that signs have been pointing in this direction for some time. “They have been involved for decades in operations of the Voice of America and Radio Liberty. The VoA has been all but shut down, and Liberty is switching to online only,” Piontkovsky said. In contrast, according to Markov, the agency’s work in Russia has been less fulfilling. “I have been told that the new administrator was straightforward: ‘We can’t say whether we are helping democracy or not.’ In other words, let’s interfere less in domestic politics and deal more with development matters,” Markov said. Diskin indicated that the Russian government had no complaints about the decision. “USAID’s declared goal is the advancement of democracy. Excuse us, but we will deal with democracy on our own. Allocating money for advancing democracy is strange. It causes suspicions and doubts. Everybody can see for themselves the fruits of the Arab Spring. They cannot be farther from civilized democracy,” Diskin said. Markov questioned that USAID was actually pulling out completely. “I am sure that USAID will never shut down its activity in Russia. Because this activity serves the United States’ interests in promoting its system of values, what they call “democratic institutions”, said Mr. Markov. The United States Agency for International Development was officially established in 1961 as an organization for providing humanitarian assistance worldwide. In 2009, USAID formally became part of the U.S. Interagency Counterinsurgency Initiative together with the U.S. Department of State and the Pentagon. This text has been abriged from the original version, which can be read in Russian in Izvestia newspaper.